The plan was to ride out of here with a little mystery intact. Instead, I am signing off 3.5 days after the big day, following an overly verbose last hurrah. Hey, I gotta be me. Most of the soreness is gone now, save a sharp pain in my right shin. I'll ignore it for a while, and go to a doctor if it really gets in the way. I am still carrying around my medal in my purse. I think I will be ready to leave it at home sometime next week. I'm not promising anything. 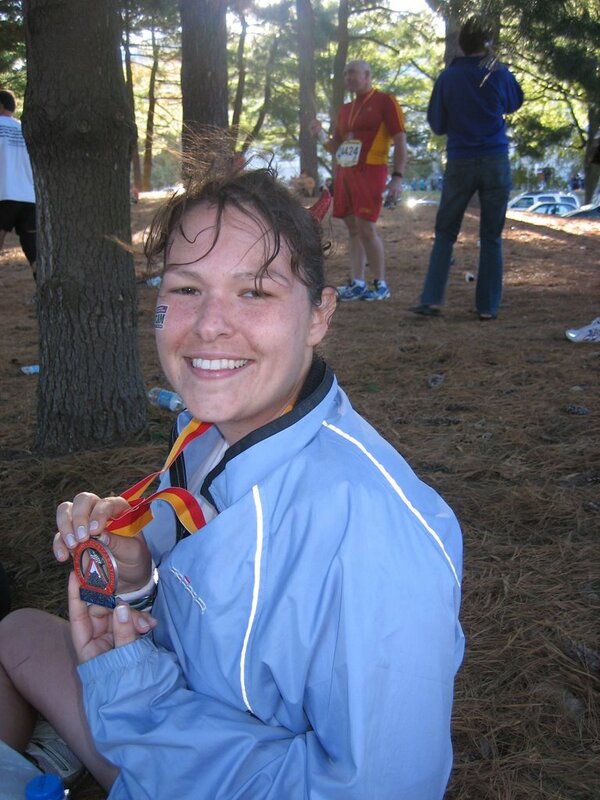 Everybody asks if the Marine Corps Marathon will be my last. I doubt it. I would love to run the New York Marathon some day, and maybe finish in slightly better shape than I did this time. More than getting a better time, I would love to feel more prepared and less close to death at the end. This year was the first time ever that I have missed Halloween (if you don't count my silly devil horns in the race), and hopefully that won't happen ever, ever again. It was worth it this time, but, I mean, c'mon. I would recommend Team in Training to anyone who thinks that marathons are for superhumans. I didn't take advantage of a lot of the services and training, but the program still got me to the finish line. The support is irreplaceable, it's nice to have people to run with and it is especially nice to have other people making all of the decisions in your training. But the best thing about TNT is the fundraising. A lot of people don't use the program because they don't want to ask friends and family for money. I was in this camp. In fact, it's the best part. Here's what I did: First, I sent an email to family and family friends. Those people feel obligated -- they will warm up the coffers. Then, I had one event -- a happy hour at a bar. My invitations to that event were the first notification to my friends that I was running a marathon or raising money. That way, I didn't have to send a letter just asking for money -- noooo, it was a letter asking for the pleasure of your company! That is way more comfortable for all involved. I made the donation minimum low ($5) and I sold running CDs. Maybe most profitable, I kept this blog. The fundraising was the best part because it got all of you so invested. It put some needed pressure on me, and it got many of you, who I might see once a year or less, back into my life. It has been a pleasure get to know you and have you get to know me. It also pulled me out of bed on countless Saturday mornings for my long runs, and it kept my spirits up for doctor's appointment after doctor's appointment, and physical therapy session after physical therapy session. It dragged me through those punishing last 3 miles of the marathon, knowing that folks were sitting in front of computers and checking their cell phones to keep up with me. That, my friends, is motivation. So, thanks for everything, guys. If anyone goes through a program like this in the future, please put me on the warming-up-the-coffers list. I would love to donate, and I would love to help create a fundraising plan. My advice is to get many people to donate small amounts. You may never have a chance to gather so much support behind you again. What a great, great ride this has been. I've started reading about your experience, and I must say that you're a great writer! I wanted to say that you've done a great job, I have enjoyed this immensley, and will be sending it to all of my friends/running buddies/readers! I'm still working my way up very slowly, very very slowly, but making progress feels incredible. It has gotten to the point where, really upset the other day, I chose to go for a run to deal with it, which I never would have done before. Any ways, I just wanted to write back and let you know how much I appreciate your blog and your link. It's great reading, and the stuff I love to hear and read about! I hope you'll keep checking in on me as I post my progress at http://021708.blogspot.com . Febuary 17th, 2007 means that the Marathon is a year away. It's pretty scary, but I'm excited to see what happens! Prologue, or Look Before You Leap!